Between the two of them, Martinez natives Kendyl and Karson Pennington have won many beauty/scholarship contest titles and leadership awards – often the same ones, but four years apart. With the age difference between the two sisters, however, they have been in the same competition only once. Well, they just might find themselves vying against each other again before too long. Kendyl, 23, will compete as Miss Boiling Springs at the Miss South Carolina Pageant June 26 – 30 in Columbia. Karson, 20, will compete as Miss Fayette County in the Miss Georgia Pageant June 12 – 16 in Columbus. If the Pennington sisters win the state crowns, then they will advance to the Miss America 2019 competition later this year. “That would be the coolest thing ever,” says Karson. The sisters had a great experience when they competed together in the Miss Georgia Outstanding Teen pageant in 2011. Kendyl was 17 years old at the time, and Karson was 13. And as luck would have it, a random drawing among the 50 contestants put them in back-to-back placement. If you ask the Pennington sisters about competing in pageants, however, they tend to say little about the contests themselves. They are more likely to talk about each other’s accomplishments or the charitable causes they promote as contestants for their platforms. And they have been doing quite a bit in life already, thank you. Kendyl is a 2016 honors graduate of University of South Carolina with a degree in philosophy and physics. She is finishing pursuit of a second degree in chemistry at USC this month and is interviewing with medical schools for fall admission. She hopes to become a pediatric oncologist one day. As an undergraduate, Kendyl danced for the USC Coquette Dance Team and served as the Relay for Life captain at USC for two years. She also was one of the top Relay for Life earners for Columbia County for several years, and Relay for Life is her pageant platform. “I had a skin cancer scare when I was in high school,” says Kendyl. In addition, while she was at Lakeside, one of her teachers was diagnosed with breast cancer. Karson, a University of Georgia sophomore, is double majoring in journalism and political science. She is in honors college at UGA and was one of 12 UGA women chosen from her class as an outstanding leader to be inducted in the Dean William Tate Honor Society. She hopes to go to law school to become a child advocacy attorney. 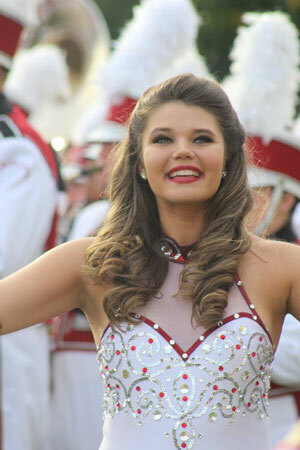 She dances for the UGA Georgettes Dance Team and serves as assistant chairwoman for UGA Miracle, a student-run philanthropic organization that recently raised $1.3 million for Children’s Healthcare of Atlanta – the university’s Children’s Miracle Network hospital. Both girls won Miss Lakeside High School, and they have received recognition for their leadership skills, academic success, extracurricular activities and community service as well. They were named Augusta Exchange Club Youth of the Year (2012 and 2016) and Georgia Exchange Club Youth of the Year (2012 and 2016). Both girls won the Ryan Clark Community Service Award/Scholarship (2012 and 2016) and were selected as Martinez Merchant Association Scholarship recipients (2012 and 2016). Miss America Organization’s partnership with Children’s Miracle Network hospitals is a driving force behind their pageant participation for Kendyl and Karson. As a service requirement, contestants competing in Miss America-sponsored pageants are expected to raise a minimum of $100 for Children’s Miracle Network hospitals and the Miss America Scholarship Fund. Kendyl competed in the 2013 Miss Georgia Pageant as Miss Augusta and in the Miss South Carolina Pageant last year as Miss Georgia-Carolina State Fair. In last year’s pageant alone, she took home almost $5,000 in scholarship money for finishing in the Top 10, winning the swimsuit competition and winning the community service award. The girls also got involved in the scholarship-based pageants for the educational opportunities they offer contestants, but they have learned life lessons as well. While some people might have the idea that pageant participants are selfish or superficial, Kendyl and Karson say they have formed wonderful friendships with their fellow contestants. Kendyl will tap dance during the talent portion of the pageant while Karson will perform a lyrical dance. “Dancing in front of thousands of people at football games makes it easier to dance on stage,” Karson says. The contestants also participate in swimsuit and evening gown competitions. Both girls agree, however, that the interview portion, which carries the most weight, is their favorite part of the pageant. Apparently, the sash doesn’t fall far from the contestant. After all, their mother, Kathy, won the interview segment of Miss Georgia when she competed in the pageant as Miss Southeast Georgia in the 1980s. She helps her daughters sharpen their interview skills by having lively discussions about current events with them. The sisters have taught each other a thing or two as well. Karson has learned to “keep trying” from her big sister, and Kendyl has learned to “keep a positive attitude” from her little sister. Until, of course, it comes to supremacy between the Bulldogs or the Gamecocks. . . . Published on April 29, 2018 in People and tagged front by Kristy Johnson.